This movie is based on a contemporary children's book, not the usual Grimm Brothers stock. 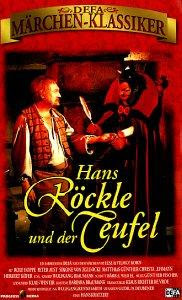 Hans Röckle is a puppeteer, inventor, blacksmith and more. He is challenged by the Devil (in almost a dozen fancy costumes) who offers him even more inventiveness, against his soul should he ever make money with an invention, build something twice, or cease inventing for 7*7 hours.